Thom launched his full-time business as a motivational speaker on April 1, 2009. He had just been laid off from his corporate marking job, and his prospects for long term employment were bleak. While many might have thought that was an impossible time to start a business, Thom had no choice. Over the next few years his business grew year over year. Maybe Thom Singer is a Pollyanna. Maybe he is too optimistic. But he lovers the famous quote from Henry Ford; “Whether you think you can, or you think you can’t…you are right. It has been interesting in the days following the release of this podcast issue how people have reacted. Making statements around “The American Dream is dead” or “The American Dream is not dead” clearly hits people at an emotional level. Most of those who have mentioned this episode to me were positive. 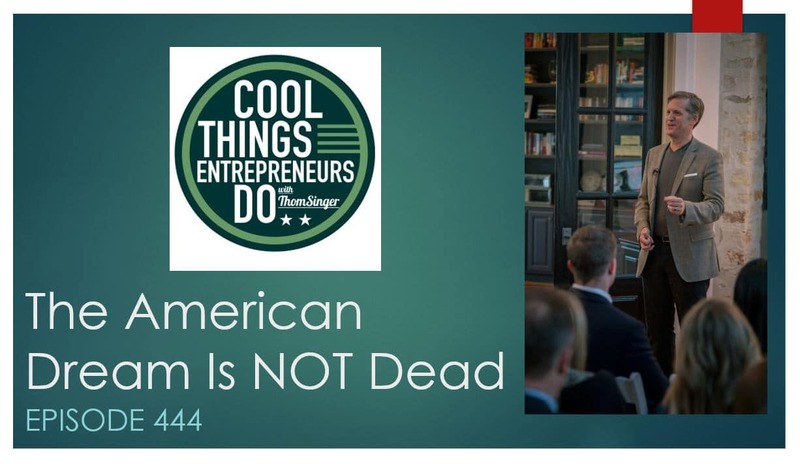 The entrepreneur community, and those with a desire to start a business, seem to believe the American Dream is alive, and see that all humans have potential. I got a few cool notes from people who were pleased that I did this episode. However, a few people attacked me. They pointed to my privilege and said others the American Dream is dead. I choose to believe that everyone can achieve great things. 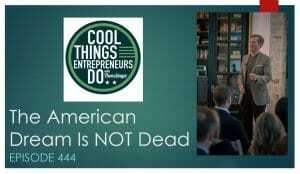 Thom Singer is the host of the “Cool Things Entrepreneurs Do” podcast. He is also a funny keynote speaker and master of ceremonies (and the author of 12 books).